When it comes to emerging energy technologies, many remote Alaska communities are on the cutting edge. That was the message from Cordova this weekend, where U.S. Senator Lisa Murkowski held a field hearing of the Senate Energy and Natural Resources Committee, which she chairs. The focus of the hearing was microgrids: self-contained electrical grids, which can operate unconnected to any larger transmission system. They’re a necessity for just about every Alaska community off the road system. Most of the grids are powered by diesel, but more and more communities are trying to cut costs by adding renewables like wind or expanding hydropower. In the process, the state has become a testing ground for technologies that are increasingly interesting to the rest of the world. Abraham Ellis is with the Sandia National Labs in New Mexico. Reasons like a major storm or cyber attack. When Murkowski asked panelists to predict the future of energy in Alaska, she got a range of futuristic answers. Cordova Mayor Clay Koplin predicted efficient smart grids, in which appliances can communicate with the larger grid about the best times to run. Meera Kohler, of the Alaska Village Electric Cooperative, said micro nuclear reactors or nuclear batteries might eventually be part of the solution in rural Alaska. 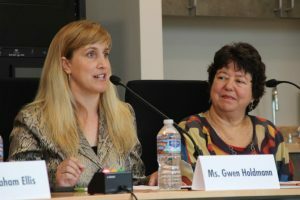 And Gwen Holdmann, of the Alaska Center for Energy and Power, said she sees major potential in hydrokinetic systems that can harness the power of rivers, waves and tides. All of the panelists stressed the need for federal investment in local energy innovation, especially during the state’s current budget crunch. The Trump administration has proposed major cuts to some renewable energy programs, but Murkowski said Congress has its own priorities.